The data here is an estimation for the year 2005 produced by the International Monetary Fund in April 2005. Burkina Faso (UK: /bɜːrˌkiːnə ˈfæsoʊ/, US: /- ˈfɑːsoʊ/ ( listen); French: [buʁkina faso]) is a landlocked country in West Africa. It covers an area of around 274,200 square kilometres (105,900 sq mi) and is surrounded by six countries: Mali to the north; Niger to the east; Benin to the southeast; Togo and Ghana to the south; and Ivory Coast to the southwest. The July 2018 population estimate by the United Nations was 19,751,651. 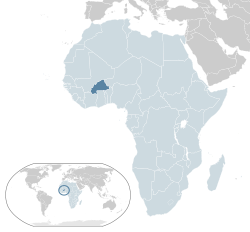 Burkina Faso is a francophone country, with French as the official language of government and business. Roughly 40% of the population speaks the Mossi language. Formerly called the Republic of Upper Volta (1958–1984), the country was renamed "Burkina Faso" on 4 August 1984 by then-President Thomas Sankara. Its citizens are known as Burkinabé (/bɜːrˈkiːnəbeɪ/ bur-KEE-nə-bay). Its capital is Ouagadougou. The Republic of Upper Volta was established on 11 December 1958 as a self-governing colony within the French Community, and on 5 August 1960 it gained full independence, with Maurice Yaméogo as President. 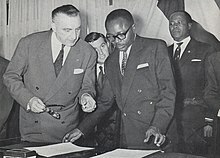 After protests by students and labour unions, Yaméogo was deposed in the 1966 coup d'état, led by Sangoulé Lamizana, who became President. His rule coincided with the Sahel drought and famine, and facing problems from the country's traditionally powerful trade unions he was deposed in the 1980 coup d'état, led by Saye Zerbo. Encountering resistance from trade unions again, Zerbo's government was overthrown in the 1982 coup d'état, led by Jean-Baptiste Ouédraogo. The leader of the leftist faction of Ouédraogo's government, Thomas Sankara, became Prime Minister but was later imprisoned. Efforts to free him led to the popularly-supported 1983 coup d'état, in which he became President. Sankara renamed the country Burkina Faso and launched an ambitious socioeconomic programme which included a nationwide literacy campaign, land redistribution to peasants, railway and road construction and the outlawing of female genital mutilation, forced marriages and polygamy. Sankara was overthrown and killed in the 1987 coup d'état led by Blaise Compaoré – deteriorating relations with former coloniser France and its ally the Ivory Coast were the reason given for the coup. In 1987, Blaise Compaoré became President and, after an alleged 1989 coup attempt, was later elected in 1991 and 1998, elections which were boycotted by the opposition and received a considerably low turnout, as well as in 2005. He remained head of state until he was ousted from power by the popular youth upheaval of 31 October 2014, after which he was exiled to the Ivory Coast. Michel Kafando subsequently became the transitional President of the country. On 16 September 2015, a military coup d'état against the Kafando government was carried out by the Regiment of Presidential Security, the former presidential guard of Compaoré. On 24 September 2015, after pressure from the African Union, ECOWAS and the armed forces, the military junta agreed to step down, and Michel Kafando was reinstated as Acting President. 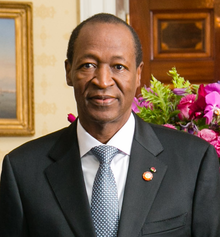 In the general election held on 29 November 2015, Roch Marc Christian Kaboré won in the first round with 53.5% of the vote and was sworn in as President on 29 December 2015. The 2018 CIA World Factbook provides this summary of the issues facing Burkina Faso. "The country experienced terrorist attacks in its capital in 2016, 2017 and 2018, and continues to mobilize resources to counter terrorist threats". In 2018, several governments were warning their citizens not to travel into the northern part of the country and into several provinces in the East Region. The CIA report also states that "Burkina Faso's high population growth, recurring drought, pervasive and perennial food insecurity, and limited natural resources result in poor economic prospects for the majority of its citizens". The report is optimistic in some aspects, particularly concerning activities being done with assistance by the International Monetary Fund. "A new three-year IMF program (2018–2020), approved in 2018, will allow the government to reduce the budget deficit and preserve critical spending on social services and priority public investments". Formerly called the Republic of Upper Volta, the country was renamed "Burkina Faso" on 4 August 1984 by then-President Thomas Sankara. The words "Burkina" and "Faso" both stem from different languages spoken in the country: "Burkina" comes from Mossi and means "upright", showing how the people are proud of their integrity, while "Faso" comes from the Dyula language and means "fatherland" (lit. "father's house"). The "bè" suffix added onto "Burkina" to form the demonym "Burkinabè" comes from the Fula language and means "men or women". The CIA summarizes the etymology as "name translates as "Land of the Honest (Incorruptible) Men". The French colony of Upper Volta was named for its location on the upper courses of the Volta River (the Black, Red and White Volta). The northwestern part of present-day Burkina Faso was populated by hunter-gatherers from 14000 BC to 5000 BC. Their tools, including scrapers, chisels and arrowheads, were discovered in 1973 through archaeological excavations. Agricultural settlements were established between 3600 and 2600 BC. The Bura culture was an Iron-Age civilization centred in the southwest portion of modern-day Niger and in the southeast part of contemporary Burkina Faso. Iron industry, in smelting and forging for tools and weapons, had developed in Sub-Saharan Africa by 1200 BC. From the 3rd to the 13th centuries AD, the Iron Age Bura culture existed in the territory of present-day southeastern Burkina Faso and southwestern Niger. Various ethnic groups of present-day Burkina Faso, such as the Mossi, Fula and Dyula, arrived in successive waves between the 8th and 15th centuries. From the 11th century, the Mossi people established several separate kingdoms. In the 1890s, during the European Scramble for Africa, the territory of Burkina Faso was invaded by France, and colonial control was established following a war of conquest between 1896 and 1904. The territory was made part of French West Africa in 1904, and the colony of French Upper Volta was established on 1 March 1919. The colony was named for its location on the upper courses of the Volta River (the Black, Red and White Volta). Historians began to debate about the exact dates when Burkina Faso's many ethnic groups arrived to the area. The Proto-Mossi arrived in the far Eastern part of what is today Burkina Faso sometime between the 8th and 11th centuries, the Samo arrived around the 15th century, the Dogon lived in Burkina Faso's north and northwest regions until sometime in the 15th or 16th centuries, and many of the other ethnic groups that make up the country's population arrived in the region during this time. During the Middle Ages the Mossi established several separate kingdoms including those of Tenkodogo, Yatenga, Zandoma, and Ouagadougou. Sometime between 1328 and 1338 Mossi warriors raided Timbuktu but the Mossi were defeated by Sonni Ali of Songhai at the Battle of Kobi in Mali in 1483. During the early 16th century the Songhai conducted many slave raids into what is today Burkina Faso. During the 18th century the Gwiriko Empire was established at Bobo Dioulasso and ethnic groups such as the Dyan, Lobi, and Birifor settled along the Black Volta. 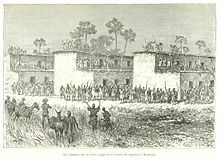 Starting in the early 1890s a series of British, French and German military officers made attempts to claim parts of what is today Burkina Faso. At times these colonialists and their armies fought the local peoples; at times they forged alliances with them and made treaties. The colonialist officers and their home governments also made treaties amongst themselves. Through a complex series of events what is today Burkina Faso eventually became a French protectorate in 1896. The eastern and western regions, where a standoff against the forces of the powerful ruler Samori Ture complicated the situation, came under French occupation in 1897. By 1898, the majority of the territory corresponding to Burkina Faso was nominally conquered; however, French control of many parts remained uncertain. The Franco-British Convention of 14 June 1898 created the country's modern borders. In the French territory, a war of conquest against local communities and political powers continued for about five years. In 1904, the largely pacified territories of the Volta basin were integrated into the Upper Senegal and Niger colony of French West Africa as part of the reorganization of the French West African colonial empire. The colony had its capital in Bamako. The language of colonial administration and schooling became French. The public education system started from humble origins. Advanced education was provided for many years during the colonial period in Dakar. Draftees from the territory participated in the European fronts of World War I in the battalions of the Senegalese Rifles. Between 1915 and 1916, the districts in the western part of what is now Burkina Faso and the bordering eastern fringe of Mali became the stage of one of the most important armed oppositions to colonial government: the Volta-Bani War. The French government finally suppressed the movement but only after suffering defeats. It also had to organize its largest expeditionary force of its colonial history to send into the country to suppress the insurrection. Armed opposition wracked the Sahelian north when the Tuareg and allied groups of the Dori region ended their truce with the government. French Upper Volta was established on 1 March 1919. The French feared a recurrence of armed uprising and had related economic considerations. To bolster its administration, the colonial government separated the present territory of Burkina Faso from Upper Senegal and Niger. The new colony was named Haute Volta, and François Charles Alexis Édouard Hesling became its first governor. Hesling initiated an ambitious road-making program to improve infrastructure and promoted the growth of cotton for export. The cotton policy – based on coercion – failed, and revenue generated by the colony stagnated. The colony was dismantled on 5 September 1932, being split between the French colonies of Ivory Coast, French Sudan and Niger. Ivory Coast received the largest share, which contained most of the population as well as the cities of Ouagadougou and Bobo-Dioulasso. France reversed this change during the period of intense anti-colonial agitation that followed the end of World War II. On 4 September 1947, it revived the colony of Upper Volta, with its previous boundaries, as a part of the French Union. The French designated its colonies as departments of metropolitan France on the European continent. On 11 December 1958 the colony achieved self-government as the Republic of Upper Volta; it joined the Franco-African Community. A revision in the organization of French Overseas Territories had begun with the passage of the Basic Law (Loi Cadre) of 23 July 1956. This act was followed by reorganization measures approved by the French parliament early in 1957 to ensure a large degree of self-government for individual territories. Upper Volta became an autonomous republic in the French community on 11 December 1958. Full independence from France was received in 1960. The Republic of Upper Volta (French: République de Haute-Volta) was established on 11 December 1958 as a self-governing colony within the French Community. The name Upper Volta related to the nation's location along the upper reaches of the Volta River. The river's three tributaries are called the Black, White and Red Volta. These were expressed in the three colors of the former national flag. Before attaining autonomy, it had been French Upper Volta and part of the French Union. On 5 August 1960, it attained full independence from France. The first president, Maurice Yaméogo, was the leader of the Voltaic Democratic Union (UDV). The 1960 constitution provided for election by universal suffrage of a president and a national assembly for five-year terms. Soon after coming to power, Yaméogo banned all political parties other than the UDV. The government lasted until 1966. After much unrest, including mass demonstrations and strikes by students, labor unions, and civil servants, the military intervened. The 1966 military coup deposed Yaméogo, suspended the constitution, dissolved the National Assembly, and placed Lt. Col. Sangoulé Lamizana at the head of a government of senior army officers. The army remained in power for four years. On 14 June 1976, the Voltans ratified a new constitution that established a four-year transition period toward complete civilian rule. Lamizana remained in power throughout the 1970s as president of military or mixed civil-military governments. Lamizana's rule coincided with the beginning of the Sahel drought and famine which had a devastating impact on Upper Volta and neighboring countries. After conflict over the 1976 constitution, a new constitution was written and approved in 1977. Lamizana was re-elected by open elections in 1978. Lamizana's government faced problems with the country's traditionally powerful trade unions, and on 25 November 1980, Col. Saye Zerbo overthrew President Lamizana in a bloodless coup. Colonel Zerbo established the Military Committee of Recovery for National Progress as the supreme governmental authority, thus eradicating the 1977 constitution. Colonel Zerbo also encountered resistance from trade unions and was overthrown two years later by Maj. Dr. Jean-Baptiste Ouédraogo and the Council of Popular Salvation (CSP) in the 1982 Upper Voltan coup d'état. The CSP continued to ban political parties and organizations, yet promised a transition to civilian rule and a new constitution. Infighting developed between the right and left factions of the CSP. The leader of the leftists, Capt. Thomas Sankara, was appointed prime minister in January 1983, but subsequently arrested. Efforts to free him, directed by Capt. Blaise Compaoré, resulted in a military coup d'état on 4 August 1983. The coup brought Sankara to power and his government began to implement a series of revolutionary programs which included mass-vaccinations, infrastructure improvements, the expansion of women's rights, encouragement of domestic agricultural consumption and anti-desertification projects. Sankara's government formed the National Council for the Revolution (CNR), with Sankara as its president, and established popular Committees for the Defense of the Revolution (CDRs). The Pioneers of the Revolution youth programme was also established. Sankara launched an ambitious socioeconomic programme for change, one of the largest ever undertaken on the African continent. His foreign policies were centred on anti-imperialism, his government denying all foreign aid, pushing for odious debt reduction, nationalising all land and mineral wealth and averting the power and influence of the International Monetary Fund (IMF) and World Bank. His domestic policies included a nationwide literacy campaign, land redistribution to peasants, railway and road construction and the outlawing of female genital mutilation, forced marriages and polygamy. Sankara pushed for agrarian self-sufficiency and promoted public health by vaccinating 2,500,000 children against meningitis, yellow fever, and measles. His national agenda also included planting over 10,000,000 trees to halt the growing desertification of the Sahel. Sankara called on every village to build a medical dispensary and had over 350 communities build schools with their own labour. On 15 October 1987, Sankara, along with twelve other officials, was killed in a coup d'état organized by Blaise Compaoré, Sankara's former colleague and Burkina Faso's president until October 2014. After the coup and although Sankara was known to be dead, some CDRs mounted an armed resistance to the army for several days. A majority of Burkinabé citizens hold that France's foreign ministry, the Quai d'Orsay, was behind Compaoré in organizing the coup. Deterioration in relations with neighbouring countries was one of the reasons given by Compaoré for the coup. Compaoré argued that Sankara had jeopardised foreign relations with the former colonial power France and neighbouring Ivory Coast. Following the coup Compaoré immediately reversed the nationalizations, overturned nearly all of Sankara's policies, returned the country back into the IMF fold, and ultimately spurned most of Sankara's legacy. Following an alleged coup attempt in 1989, limited democratic reforms were introduced in 1990 by Compaoré. Under the new constitution, Compaoré was re-elected without opposition in 1991. In 1998 Compaoré won election in a landslide. In 2004, 13 people were tried for plotting a coup against President Compaoré and the coup's alleged mastermind was sentenced to life imprisonment. As of 2014[update], Burkina Faso remained one of the least developed countries in the world. Compaoré's government had played the role of negotiator in several West-African disputes including the 2010–11 Ivorian crisis, the Inter-Togolese Dialogue, and the 2012 Malian Crisis. Between February and April 2011, the death of a schoolboy provoked protests throughout the country, coupled with a military mutiny and a magistrates' strike. Starting on 28 October 2014 protesters began to march and demonstrate in Ouagadougou against President Blaise Compaoré who appeared ready to amend the constitution and extend his 27-year rule. On 30 October, some protesters set fire to the parliament and took over the national TV headquarters. 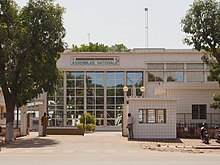 Ouagadougou International Airport was closed and MPs suspended the vote on changing the constitution to allow Compaoré to stand for re-election in 2015. Later in the day, the military dissolved all government institutions and set a curfew. On 31 October 2014, President Compaoré, facing mounting pressure, resigned after 27 years in office. Lt. Col. Isaac Zida said that he would lead the country during its transitional period before the planned 2015 presidential election but there were concerns over his close ties to the former president. In November 2014 opposition parties, civil society groups and religious leaders adopted a plan for a transitional authority to guide Burkina Faso to elections. Under the plan Michel Kafando was made the transitional President of Burkina Faso and Lt. Col. Zida became the acting Prime Minister and Defense Minister. In September 2015, the Regiment of Presidential Security (RSP) seized the country's president and prime minister, and declared the National Council for Democracy the new national government. However, on 22 September 2015, the coup leader, Gilbert Diendéré, apologized and promised to restore the civilian government. On 23 September 2015, the prime minister and interim president were restored to power. General elections were held in Burkina Faso on 29 November 2015. Roch Marc Christian Kaboré won the election in the first round with 53.5% of the vote, defeating businessman Zéphirin Diabré who took 29.7%. Kaboré was sworn in as President on 29 December 2015. President Blaise Compaoré ruled Burkina Faso from a coup d'état in 1987 until he lost power in 2014. With French help, Blaise Compaoré seized power in a coup d'état in 1987. He overthrew his long-time friend and ally Thomas Sankara, who was killed in the coup. The constitution of 2 June 1991 established a semi-presidential government: its parliament could be dissolved by the President of the Republic, who was to be elected for a term of seven years. In 2000, the constitution was amended to reduce the presidential term to five years and set term limits to two, preventing successive re-election. The amendment took effect during the 2005 elections. If passed beforehand, it would have prevented Compaoré from being reelected. Other presidential candidates challenged the election results. But in October 2005, the constitutional council ruled that, because Compaoré was the sitting president in 2000, the amendment would not apply to him until the end of his second term in office. This cleared the way for his candidacy in the 2005 election. On 13 November 2005, Compaoré was reelected in a landslide, because of a divided political opposition. In the 2010 Presidential elections, President Compaoré was re-elected. Only 1.6 million Burkinabés voted, out of a total population 10 times that size. The 2011 Burkinabè protests were a series of popular protests that called for the resignation of Compaoré, democratic reforms, higher wages for troops and public servants and economic freedom. As a result, governors were replaced and wages for public servants were raised. The parliament consisted of one chamber known as the National Assembly which had 111 seats with members elected to serve five-year terms. There was also a constitutional chamber, composed of ten members, and an economic and social council whose roles were purely consultative. The 1991 constitution created a bicameral parliament but the upper house (Chamber of Representatives) was abolished in 2002. The Compaoré administration had worked to decentralize power by devolving some of its powers to regions and municipal authorities. But the widespread distrust of politicians and lack of political involvement by many residents complicated this process. Critics described this as a hybrid decentralisation. Political freedoms are severely restricted in Burkina Faso. Human rights organizations had criticised the Compaoré administration for numerous acts of state-sponsored violence against journalists and other politically active members of society. In mid-September 2015 the Kafando government, along with the rest of the post-October 2014 political order, was temporarily overthrown in a coup attempt by the Regiment of Presidential Security (RSP). They installed Gilbert Diendéré as chairman of the new National Council for Democracy. On 23 September 2015, the prime minister and interim president were restored to power. The national elections were subsequently rescheduled for 29 November. Kaboré won the election in the first round of voting, receiving 53.5% of the vote against 29.7% for the second place candidate, Zephirin Diabré. He was sworn in as President on 29 December 2015. The BBC described the president as a "French-educated banker ... [who] sees himself as a social democrat, and has pledged to reduce youth unemployment, improve education and healthcare, and make health provision for children under six free of charge". The prime minister is head of government and is appointed by the president with the approval of the National Assembly. He is responsible for recommending a cabinet for appointment by the president. Paul Kaba Thieba was appointed PM in early 2016. According to a World Bank Report in late 2018, the political climate was stable; the government was facing "social discontent marked by major strikes and protests, organized by unions in several economic sectors, to demand salary increases and social benefits .... and increasingly frequent jihadist attacks". The next elections would be held in 2020. In 2015, Kaboré promised to revise the 1991 constitution. The revision was completed in 2018. One condition prevents any individual from serving as president for more than ten years either consecutively or intermittently and provides a method for impeaching a president. A referendum on the constitution for the Fifth Republic was scheduled for March 24, 2019. Certain rights are also enshrined in the revised wording: access to drinking water, to decent housing and a recognition of the right to civil disobedience, for example. The referendum was required because the opposition parties in Parliament refused to sanction the proposed text. Burkina Faso is a member of the African Union, G5 Sahel, Community of Sahel-Saharan States, La Francophonie, Organisation of Islamic Cooperation, Economic Community of West African States, and United Nations. The army consists of some 6,000 men in voluntary service, augmented by a part-time national People's Militia composed of civilians between 25 and 35 years of age who are trained in both military and civil duties. According to Jane's Sentinel Country Risk Assessment, Burkina Faso's Army is undermanned for its force structure and poorly equipped, but has wheeled light-armour vehicles, and may have developed useful combat expertise through interventions in Liberia and elsewhere in Africa. In terms of training and equipment, the regular Army is believed to be neglected in relation to the élite Regiment of Presidential Security (French: Régiment de la Sécurité Présidentielle – RSP). Reports have emerged in recent years of disputes over pay and conditions. There is an air force with some 19 operational aircraft, but no navy, as the country is landlocked. Military expenses constitute approximately 1.2% of the nation's GDP. In April 2011, there was an army mutiny; the president named new chiefs of staff, and a curfew was imposed in Ouagadougou. Burkina Faso employs numerous police and security forces, generally modeled after organizations used by French police. France continues to provide significant support and training to police forces. The Gendarmerie Nationale is organized along military lines, with most police services delivered at the brigade level. The Gendarmerie operates under the authority of the Minister of Defence, and its members are employed chiefly in the rural areas and along borders. There is a municipal police force controlled by the Ministry of Territorial Administration; a national police force controlled by the Ministry of Security; and an autonomous Regiment of Presidential Security (Régiment de la Sécurité Présidentielle, or RSP), a 'palace guard' devoted to the protection of the President of the Republic. Both the gendarmerie and the national police are subdivided into both administrative and judicial police functions; the former are detailed to protect public order and provide security, the latter are charged with criminal investigations. All foreigners and citizens are required to carry photo ID passports, or other forms of identification or risk a fine, and police spot identity checks are commonplace for persons traveling by auto, bush-taxi, or bus. Satellite image of Burkina Faso. 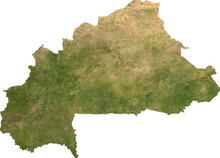 Burkina Faso lies mostly between latitudes 9° and 15°N (a small area is north of 15°), and longitudes 6°W and 3°E. It is made up of two major types of countryside. The larger part of the country is covered by a peneplain, which forms a gently undulating landscape with, in some areas, a few isolated hills, the last vestiges of a Precambrian massif. The southwest of the country, on the other hand, forms a sandstone massif, where the highest peak, Ténakourou, is found at an elevation of 749 meters (2,457 ft). The massif is bordered by sheer cliffs up to 150 m (492 ft) high. The average altitude of Burkina Faso is 400 m (1,312 ft) and the difference between the highest and lowest terrain is no greater than 600 m (1,969 ft). Burkina Faso is therefore a relatively flat country. The country owes its former name of Upper Volta to three rivers which cross it: the Black Volta (or Mouhoun), the White Volta (Nakambé) and the Red Volta (Nazinon). The Black Volta is one of the country's only two rivers which flow year-round, the other being the Komoé, which flows to the southwest. The basin of the Niger River also drains 27% of the country's surface. The Niger's tributaries – the Béli, Gorouol, Goudébo, and Dargol – are seasonal streams and flow for only four to six months a year. They still can flood and overflow, however. The country also contains numerous lakes – the principal ones are Tingrela, Bam, and Dem. The country contains large ponds, as well, such as Oursi, Béli, Yomboli, and Markoye. Water shortages are often a problem, especially in the north of the country. The country is divided into 13 administrative regions. These regions encompass 45 provinces and 301 departments. Each region is administered by a governor. Burkina Faso has a primarily tropical climate with two very distinct seasons. In the rainy season, the country receives between 60 and 90 cm (23.6 and 35.4 in) of rainfall; in the dry season, the harmattan – a hot dry wind from the Sahara – blows. The rainy season lasts approximately four months, May/June through September, and is shorter in the north of the country. Three climatic zones can be defined: the Sahel, the Sudan-Sahel, and the Sudan-Guinea. The Sahel in the north typically receives less than 60 cm (23.6 in) of rainfall per year and has high temperatures, 5–47 °C (41–117 °F). A relatively dry tropical savanna, the Sahel extends beyond the borders of Burkina Faso, from the Horn of Africa to the Atlantic Ocean, and borders the Sahara to its north and the fertile region of the Sudan to the South. Situated between 11°3' and 13°5' north latitude, the Sudan-Sahel region is a transitional zone with regards to rainfall and temperature. Further to the south, the Sudan-Guinea zone receives more than 90 cm (35.4 in) of rain each year and has cooler average temperatures. Burkina Faso's natural resources include gold, manganese, limestone, marble, phosphates, pumice, and salt. Burkina Faso has a larger number of elephants than many countries in West Africa. Lions, leopards and buffalo can also be found here, including the dwarf or red buffalo, a smaller reddish-brown animal which looks like a fierce kind of short-legged cow. Other large predators live in Burkina Faso, such as the cheetah, the caracal or African lynx, the spotted hyena and the African wild dog, one of the continent's most endangered species. and several reserves: see List of national parks in Africa and Nature reserves of Burkina Faso. The value of Burkina Faso's exports fell from $2.77 billion in 2011 to $754 million in 2012. Agriculture represents 32% of its gross domestic product and occupies 80% of the working population. It consists mostly of rearing livestock. Especially in the south and southwest, the people grow crops of sorghum, pearl millet, maize (corn), peanuts, rice and cotton, with surpluses to be sold. A large part of the economic activity of the country is funded by international aid. The top five export commodities in 2017 were as follows, in order of importance: gems, precious metals, US$1.9 billion (78.5% of total exports), cotton, $198.7 million (8.3%), ores, slag, ash, $137.6 million (5.8%), fruits, nuts: $76.6 million (3.2%) and oil seeds: $59.5 million (2.5%). A December 2018 report from the World Bank indicates that in 2017, economic growth increased to 6.4% in 2017 (vs. 5.9% in 2016) primarily due to gold production and increased investment in infrastructure. The increase in consumption linked to growth of the wage bill also supported economic growth. Inflation remained low, 0.4% that year but the public deficit grew to 7.7% of GDP (vs. 3.5% in 2016). The government was continuing to get financial aid and loans to finance the debt. To finance the public deficit, the Government combined concessional aid and borrowing on the regional market. The World Bank said that the economic outlook remained favorable in the short and medium term, although that could be negatively impacted. Risks included high oil prices (imports), lower prices of gold and cotton (exports) as well as terrorist threat and labour strikes. Burkina Faso is part of the West African Monetary and Economic Union (UMEOA) and has adopted the CFA franc. This is issued by the Central Bank of the West African States (BCEAO), situated in Dakar, Senegal. The BCEAO manages the monetary and reserve policy of the member states, and provides regulation and oversight of financial sector and banking activity. A legal framework regarding licensing, bank activities, organizational and capital requirements, inspections and sanctions (all applicable to all countries of the Union) is in place, having been reformed significantly in 1999. Microfinance institutions are governed by a separate law, which regulates microfinance activities in all WAEMU countries. The insurance sector is regulated through the Inter-African Conference on Insurance Markets (CIMA). In 2018, tourism was almost non-existent in large parts of the country. The U.S. government (and others) warn their citizens not to travel into large parts of Burkina Fasino: "The northern Sahel border region shared with Mali and Niger due to crime and terrorism. The provinces of Kmoandjari, Tapoa, Kompienga, and Gourma in East Region due to crime and terrorism". The 2018 CIA World Factbook provides this updated summary. "Burkina Faso is a poor, landlocked country that depends on adequate rainfall. Irregular patterns of rainfall, poor soil, and the lack of adequate communications and other infrastructure contribute to the economy’s vulnerability to external shocks. About 80% of the population is engaged in subsistence farming and cotton is the main cash crop. The country has few natural resources and a weak industrial base. Cotton and gold are Burkina Faso’s key exports ...The country has seen an upswing in gold exploration, production, and exports. While the end of the political crisis has allowed Burkina Faso’s economy to resume positive growth, the country’s fragile security situation could put these gains at risk. Political insecurity in neighboring Mali, unreliable energy supplies, and poor transportation links pose long-term challenges." The report also highlights the 2018-2020 International Monetary Fund program, including the government's plan to "reduce the budget deficit and preserve critical spending on social services and priority public investments". A 2018 report by the African Development Bank Group discussed a macroeconomic evolution: "higher investment and continued spending on social services and security that will add to the budget deficit". This group's prediction for 2018 indicated that the budget deficit would be reduced to 4.8% of GDP in 2018 and to 2.9% in 2019. Public debt associated with the National Economic and Social Development Plan was estimated at 36.9% of GDP in 2017. Burkina Faso is a member of the Organization for the Harmonization of Business Law in Africa (OHADA). The country also belongs to the United Nations, International Monetary Fund, World Bank, and World Trade Organization. There is mining of copper, iron, manganese, gold, cassiterite (tin ore), and phosphates. These operations provide employment and generate international aid. Gold production increased 32% in 2011 at six gold mine sites, making Burkina Faso the fourth-largest gold producer in Africa, after South Africa, Mali and Ghana. A 2018 report indicated that the country expected record 55 tonnes of gold in that year, a two-thirds increase over 2013. According to Oumarou Idani, there is a more important issue. "We have to diversify production. We mostly only produce gold, but we have huge potential in manganese, zinc, lead, copper, nickel and limestone". According to the Global Hunger Index, a multidimensional tool used to measure and track a country's hunger levels, Burkina Faso ranked 65 out of 78 countries in 2013. It is estimated that there are currently over 1.5 million children who are at risk of food insecurity in Burkina Faso, with around 350,000 children who are in need of emergency medical assistance. However, only about a third of these children will actually receive adequate medical attention. Only 11.4 percent of children under the age of two receive the daily recommended number of meals. Stunted growth as a result of food insecurity is a severe problem in Burkina Faso, affecting at least a third of the population from 2008 to 2012. Additionally, stunted children, on average, tend to complete less school than children with normal growth development, further contributing to the low levels of education of the Burkina Faso population. The European Commission expects that approximately 500,000 children under age 5 in Burkina Faso will suffer from acute malnutrition in 2015, including around 149,000 who will suffer from its most life-threatening form. Rates of micronutrient deficiencies are also high. According to the Demographic and Health Survey (DHS 2010), 49 percent of women and 88 percent of children under the age of five suffer from anemia. Forty percent of infant deaths can be attributed to malnutrition, and in turn, these infant mortality rates have decreased Burkina Faso's total work force by 13.6 percent, demonstrating how food security affects more aspects of life beyond health. These high rates of food insecurity and the accompanying effects are even more prevalent in rural populations compared to urban ones, as access to health services in rural areas is much more limited and awareness and education of children's nutritional needs is lower. An October 2018 report by USAid stated that droughts and floods remained problematic, and that "violence and insecurity are disrupting markets, trade and livelihoods activities in some of Burkina Faso’s northern and eastern areas". The report estimated that over 954,300 people needed food security support, and that, according to UNICEF, an "estimated 187,200 children under 5 years of age will experience severe acute malnutrition". Agencies providing assistance at the time included USAID’s Office of Food for Peace (FFP) working with the UN World Food Programme, the NGO Oxfam Intermón and ACDI/VOCA. A woman waiting for food aid at a World Food Programme food distribution site. The United Nation's World Food Programme has worked on programs that are geared towards increasing food security in Burkina Faso. The Protracted Relief and Recovery Operation 200509 (PRRO) was formed to respond to the high levels of malnutrition in Burkina Faso, following the food and nutrition crisis in 2012. The efforts of this project are mostly geared towards the treatment and prevention of malnutrition and include take home rations for the caretakers of those children who are being treated for malnutrition. Additionally, the activities of this operation contribute to families' abilities to withstand future food crises. Better nutrition among the two most vulnerable groups, young children and pregnant women, prepares them to be able to respond better in times when food security is compromised, such as in droughts. The Country Programme (CP) has two parts: food and nutritional assistance to people with HIV/AIDS, and a school feeding program for all primary schools in the Sahel region. The HIV/AIDS nutrition program aims to better the nutritional recovery of those who are living with HIV/AIDS and to protect at-risk children and orphans from malnutrition and food security. As part of the school feeding component, the Country Programme's goals are to increase enrollment and attendance in schools in the Sahel region, where enrollment rates are below the national average. Furthermore, the program aims at improving gender parity rates in these schools, by providing girls with high attendance in the last two years of primary school with take-home rations of cereals as an incentive to households, encouraging them to send their girls to school. The WFP concluded the formation of a subsequently approved plan in August 2018 "to support the Government’s vision of 'a democratic, unified and united nation, transforming the structure of its economy and achieving a strong and inclusive growth through patterns of sustainable consumption and production.' It will take important steps in WFP’s new strategic direction for strengthened national and local capacities to enable the Government and communities to own, manage, and implement food and nutrition security programmes by 2030". The World Bank was established in 1944, and comprises five institutions whose shared goals are to end extreme poverty by 2030 and to promote shared prosperity by fostering income growth of the lower forty percent of every country. One of the main projects the World Bank is working on to reduce food insecurity in Burkina Faso is the Agricultural Productivity and Food Security Project. According to the World Bank, the objective of this project is to "improve the capacity of poor producers to increase food production and to ensure improved availability of food products in rural markets." The Agricultural Productivity and Food Security Project has three main parts. Its first component is to work towards the improvement of food production, including financing grants and providing 'voucher for work' programs for households who cannot pay their contribution in cash. The project's next component involves improving the ability of food products, particularly in rural areas. This includes supporting the marketing of food products, and aims to strengthen the capabilities of stakeholders to control the variability of food products and supplies at local and national levels. Lastly, the third component of this project focuses on institutional development and capacity building. Its goal is to reinforce the capacities of service providers and institutions who are specifically involved in project implementation. The project's activities aim to build capacities of service providers, strengthen the capacity of food producer organizations, strengthen agricultural input supply delivery methods, and manage and evaluate project activities. The December 2018 report by the World Bank indicated that the poverty rate fell slightly between 2009 and 2014, from 46% to a still high 40.1%. The report provided this updated summary of the country's development challenges: "Burkina Faso remains vulnerable to climatic shocks related to changes in rainfall patterns and to fluctuations in the prices of its export commodities on world markets. Its economic and social development will, to some extent, be contingent on political stability in the country and the subregion, its openness to international trade, and export diversification". A group of farmers in Tarfila, Burkina Faso. Burkina Faso is faced with high levels of food insecurity. As defined by the 1996 World Food Summit, "food security exists when all people, at all times, have physical and economic access to sufficient safe and nutritious food that meets their dietary needs and food preferences for an active and healthy lifestyle." There has not been much successful improvement on this issue of food security within recent years. Burkina Faso's rapidly growing population (around 3.6% annually) continues to put a strain on the country's resources and infrastructure, which can further limit accessibility to food. Because the country is landlocked and prone to natural disasters, including drought and floods, many families struggle to protect themselves from severe hunger. While recent harvest productions have improved some, much of the population is still having a hard time overcoming the continuous food and nutrition crises of the past decade. Malnutrition is especially common in women and children, with large amounts of the population suffering from stunted growth and micronutrient deficiencies such as anemia. Food insecurity has grown to be a structural problem in Burkina Faso, only to be intensified by high food prices. All of these factors combined with high poverty levels have left Burkina Faso vulnerable to chronic high levels of food insecurity and malnutrition. Poverty continues to be strongly linked to food insecurity. As one of the poorest countries in the world, Burkina Faso has around 43.7% of its population living under the poverty line and ranked 185 out of 188 countries on the UNDP Human Development Index in 2015. The Human Development Index is a measure of quality of life, taking into account three main areas of human development: longevity, education, and economic standard of living. These high levels of poverty found in Burkina Faso, combined with the soaring food prices of the global food crisis continue to contribute to Burkina Faso's issue of food insecurity. The global food crisis of 2007–2008 was a drastic surge in food prices that lead to high rates of hunger, malnutrition, and political and economic instability in nations across the globe. This strongly affected Burkina Faso because around 80% of Burkina Faso's population is rural, relying on subsistence farming to make a living. For instance, when natural disasters such as floods, droughts, or locust attacks occur and cause crops to fail, farmers in Burkina Faso become dependent on grain purchases. Because of the global food crisis, local grain prices dramatically increased, limiting farmers' access to grain through market exchanges. While services remain underdeveloped, the National Office for Water and Sanitation (ONEA), a state-owned utility company run along commercial lines, is emerging as one of the best-performing utility companies in Africa. High levels of autonomy and a skilled and dedicated management have driven ONEA's ability to improve production of and access to clean water. Since 2000, nearly 2 million more people have access to water in the four principal urban centres in the country; the company has kept the quality of infrastructure high (less than 18% of the water is lost through leaks – one of the lowest in sub-Saharan Africa), improved financial reporting, and increased its annual revenue by an average of 12% (well above inflation). Challenges remain, including difficulties among some customers in paying for services, with the need to rely on international aid to expand its infrastructure. The state-owned, commercially run venture has helped the nation reach its Millennium Development Goal (MDG) targets in water-related areas, and has grown as a viable company. However, access to drinking has improved over the last 28 years. According to UNICEF, access to drinking water has increased from 39 to 76% in rural areas between 1990 and 2015. In this same time span, access to drinking water increased from 75 to 97% in urban areas. A 33-megawatt solar power plant in Zagtouli, near Ouagadougou, came online in late November, 2017. At the time of its construction, it was the largest solar power facility in West Africa. The growth rate in Burkina Faso is high although it continues to be plagued by corruption and incursions from terrorist groups from Mali and Niger. 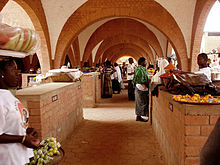 The railway station in Bobo Dioulasso was built during the colonial era and remains in operation. Transport in Burkina Faso is limited by relatively underdeveloped infrastructure. As of June 2014 the main international airport, Ouagadougou Airport, had regularly scheduled flights to many destinations in West Africa as well as Paris, Brussels and Istanbul. The other international airport, Bobo Dioulasso Airport, has flights to Ouagadougou and Abidjan. Rail transport in Burkina Faso consists of a single line which runs from Kaya to Abidjan in Ivory Coast via Ouagadougou, Koudougou, Bobo Dioulasso and Banfora. Sitarail operates a passenger train three times a week along the route. There are 15,000 kilometres of roads in Burkina Faso, of which 2,500 kilometres are paved. In 2009, Burkina Faso spent 0.20% of GDP on research and development (R&D), one of the lowest ratios in West Africa. There were 48 researchers (in full-time equivalents) per million inhabitants in 2010, which is more than twice the average for sub-Saharan Africa (20 per million population in 2013) and higher than the ratio for Ghana and Nigeria (39). It is, however, much lower than the ratio for Senegal (361 per million inhabitants). In Burkina Faso in 2010, 46% of researchers were working in the health sector, 16% in engineering, 13% in natural sciences, 9% in agricultural sciences, 7% in the humanities and 4% in social sciences. In January 2011, the government created the Ministry of Scientific Research and Innovation. Up until then, management of science, technology and innovation had fallen under the Department of Secondary and Higher Education and Scientific Research. Within this ministry, the Directorate General for Research and Sector Statistics is responsible for planning. A separate body, the Directorate General of Scientific Research, Technology and Innovation, co-ordinates research. This is a departure from the pattern in many other West African countries where a single body fulfils both functions. The move signals the government's intention to make science and technology a development priority. In 2012, Burkina Faso adopted a National Policy for Scientific and Technical Research, the strategic objectives of which are to develop R&D and the application and commercialization of research results. The policy also makes provisions for strengthening the ministry's strategic and operational capacities. One of the key priorities is to improve food security and self-sufficiency by boosting capacity in agricultural and environmental sciences. The creation of a centre of excellence in 2014 at the International Institute of Water and Environmental Engineering in Ouagadougou within the World Bank project provides essential funding for capacity-building in these priority areas. A dual priority is to promote innovative, effective and accessible health systems. The government wishes to develop, in parallel, applied sciences and technology and social and human sciences. To complement the national research policy, the government has prepared a National Strategy to Popularize Technologies, Inventions and Innovations (2012) and a National Innovation Strategy (2014). Other policies also incorporate science and technology, such as that on Secondary and Higher Education and Scientific Research (2010), the National Policy on Food and Nutrition Security (2014) and the National Programme for the Rural Sector (2011). In 2013, Burkina Faso passed the Science, Technology and Innovation Act establishing three mechanisms for financing research and innovation, a clear indication of high-level commitment. These mechanisms are the National Fund for Education and Research, the National Fund for Research and Innovation for Development and the Forum of Scientific Research and Technological Innovation. Burkina Faso is an ethnically integrated, secular state. Most of Burkina Faso's people are concentrated in the south and center of the country, where their density sometimes exceeds 48 persons per square kilometer (125/sq. mi.). Hundreds of thousands of Burkinabè migrate regularly to Ivory Coast and Ghana, mainly for seasonal agricultural work. These flows of workers are affected by external events; the September 2002 coup attempt in Ivory Coast and the ensuing fighting meant that hundreds of thousands of Burkinabè returned to Burkina Faso. The regional economy suffered when they were unable to work. In 2015, most of the population belonged to "one of two West African ethnic cultural groups: the Voltaic and the Mande. Voltaic Mossi make up about 50% of the population and are descended from warriors who moved to the area from Ghana around 1100, establishing an empire that lasted over 800 years". The total fertility rate of Burkina Faso is 5.93 children born per woman (2014 estimates), the sixth highest in the world. In 2009 the U.S. Department of State's Trafficking in Persons Report reported that slavery in Burkina Faso continued to exist and that Burkinabè children were often the victims. Slavery in the Sahel states in general, is an entrenched institution with a long history that dates back to the Arab slave trade. In 2018, an estimated 82,000 people in the country were living under "modern slavery" according to the Global Slavery Index. Burkina Faso's 17.3 million people belong to two major West African ethnic cultural groups—the Voltaic and the Mande (whose common language is Dioula). The Voltaic Mossi make up about one-half of the population. The Mossi claim descent from warriors who migrated to present-day Burkina Faso from northern Ghana around 1100 AD. They established an empire that lasted more than 800 years. Predominantly farmers, the Mossi kingdom is led by the Mogho Naba, whose court is in Ouagadougou. Burkina Faso is a multilingual country. An estimated 69 languages are spoken there, of which about 60 languages are indigenous. The Mossi language (Mossi: Mòoré) is spoken by about 40% of the population, mainly in the central region around the capital, Ouagadougou, along with other, closely related Gurunsi languages scattered throughout Burkina. In the west, Mande languages are widely spoken, the most predominant being Dyula (also known as Jula or Dioula), others including Bobo, Samo, and Marka. The Fula language (Fula: Fulfulde, French: Peuhl) is widespread, particularly in the north. The Gourmanché language is spoken in the east, while the Bissa language is spoken in the south. The official language is French, which was introduced during the colonial period. French is the principal language of administrative, political and judicial institutions, public services, and the press. It is the only language for laws, administration and courts. Statistics on religion in Burkina Faso are inexact because Islam and Christianity are often practiced in tandem with indigenous religious beliefs. The Government of Burkina Faso 2006 census reported that 60.5% of the population practice Islam, and that the majority of this group belong to the Sunni branch, while a small minority adheres to Shia Islam. A significant number of Sunni Muslims identify with the Tijaniyah Sufi order. The government estimated that 23.2% of the population are Christians (19% being Roman Catholics and 4.2% members of Protestant denominations); 15.3% follow traditional indigenous beliefs, 0.6% have other religions, and 0.4% have none. In 2012, the average life expectancy was estimated at 57 for male and 59 for female. The under five mortality rate and the infant mortality rate were respectively 102 and 66 per 1000 live births. In 2014, the median age of its inhabitants is 17 and the estimated population growth rate is 3.05%. In 2011, health expenditures was 6.5% of GDP; the maternal mortality ratio was estimated at 300 deaths per 100000 live births and the physician density at 0.05 per 1000 population in 2010. In 2012, it was estimated that the adult HIV prevalence rate (ages 15–49) was 1.0%. According to the 2011 UNAIDS Report, HIV prevalence is declining among pregnant women who attend antenatal clinics. According to a 2005 World Health Organization report, an estimated 72.5% of Burkina Faso's girls and women have had female genital mutilation, administered according to traditional rituals. Central government spending on health was 3% in 2001. As of 2009[update], studies estimated there were as few as 10 physicians per 100,000 people. In addition, there were 41 nurses and 13 midwives per 100,000 people. Demographic and Health Surveys has completed three surveys in Burkina Faso since 1993, and had another in 2009. A recent Dengue fever outbreak in 2016 killed 20 patients. Cases of the disease were reported from all 12 districts of Ouagadougou. The Gando primary school. Its architect, Diébédo Francis Kéré, received the Aga Khan Award for Architecture in 2004. Education in Burkina Faso is divided into primary, secondary and higher education. High school costs approximately CFA 25,000 (US$50) per year, which is far above the means of most Burkinabè families. Boys receive preference in schooling; as such, girls' education and literacy rates are far lower than their male counterparts. An increase in girls' schooling has been observed because of the government's policy of making school cheaper for girls and granting them more scholarships. To proceed from primary to middle school, middle to high school or high school to college, national exams must be passed. Institutions of higher education include the University of Ouagadougou, The Polytechnic University of Bobo-Dioulasso, and the University of Koudougou, which is also a teacher training institution. There are some small private colleges in the capital city of Ouagadougou but these are affordable to only a small portion of the population. There is also the International School of Ouagadougou (ISO), an American-based private school located in Ouagadougou. The 2008 UN Development Program Report ranked Burkina Faso as the country with the lowest level of literacy in the world, despite a concerted effort to double its literacy rate from 12.8% in 1990 to 25.3% in 2008. Literature in Burkina Faso is based on the oral tradition, which remains important. In 1934, during French occupation, Dim-Dolobsom Ouedraogo published his Maximes, pensées et devinettes mossi (Maximes, Thoughts and Riddles of the Mossi), a record of the oral history of the Mossi people. The oral tradition continued to have an influence on Burkinabè writers in the post-independence Burkina Faso of the 1960s, such as Nazi Boni and Roger Nikiema. The 1960s saw a growth in the number of playwrights being published. Since the 1970s, literature has developed in Burkina Faso with many more writers being published. The theatre of Burkina Faso combines traditional Burkinabè performance with the colonial influences and post-colonial efforts to educate rural people to produce a distinctive national theatre. 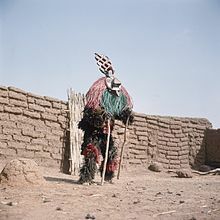 Traditional ritual ceremonies of the many ethnic groups in Burkina Faso have long involved dancing with masks. Western-style theatre became common during colonial times, heavily influenced by French theatre. With independence came a new style of theatre inspired by forum theatre aimed at educating and entertaining Burkina Faso's rural people. Artisan garland of decorative painted gourds in Ouagadougou. In addition to several rich traditional artistic heritages among the peoples, there is a large artist community in Burkina Faso, especially in Ouagadougou. Much of the crafts produced are for the country's growing tourist industry. Burkina Faso also hosts the International Art and Craft Fair, Ouagadougou. It is better known by its French name as SIAO, Le Salon International de l' Artisanat de Ouagadougou, and is one of the most important African handicraft fairs. 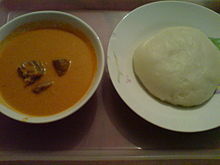 A plate of fufu (right) accompanied with peanut soup. Typical of West African cuisine, Burkina Faso's cuisine is based on staple foods of sorghum, millet, rice, maize, peanuts, potatoes, beans, yams and okra. The most common sources of animal protein are chicken, chicken eggs and fresh water fish. A typical Burkinabè beverage is Banji or Palm Wine, which is fermented palm sap; and Zoom-kom, or "grain water" purportedly the national drink of Burkina Faso. Zoom-kom is milky-looking and whitish, having a water and cereal base, best drunk with ice cubes. In the more rural regions, in the outskirts of Burkina, you would find Dolo, which is drink made from fermented millet. The cinema of Burkina Faso is an important part of West African and African film industry. Burkina's contribution to African cinema started with the establishment of the film festival FESPACO (Festival Panafricain du Cinéma et de la Télévision de Ouagadougou), which was launched as a film week in 1969. Many of the nation's filmmakers are known internationally and have won international prizes. For many years the headquarters of the Federation of Panafrican Filmmakers (FEPACI) was in Ouagadougou, rescued in 1983 from a period of moribund inactivity by the enthusiastic support and funding of President Sankara. (In 2006 the Secretariat of FEPACI moved to South Africa, but the headquarters of the organization is still in Ouagadougou.) Among the best known directors from Burkina Faso are Gaston Kaboré, Idrissa Ouedraogo and Dani Kouyate. 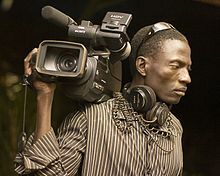 Burkina produces popular television series such as Les Bobodiouf. Internationally known filmmakers such as Ouedraogo, Kabore, Yameogo, and Kouyate make popular television series. 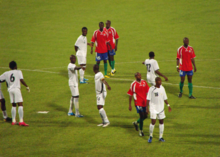 Burkina Faso national football team in white during a football match. Sport in Burkina Faso is widespread and includes football (soccer), basketball, cycling, rugby union, handball, tennis, boxing and martial arts. Football is very popular in Burkina Faso, played both professionally, and informally in towns and villages across the country. The national team is nicknamed "Les Etalons" ("the Stallions") in reference to the legendary horse of Princess Yennenga. In 1998, Burkina Faso hosted the Africa Cup of Nations for which the Omnisport Stadium in Bobo-Dioulasso was built. In 2013, Burkina Faso qualified for the African Cup of Nations in South Africa, reached the final, but then lost to Nigeria by the score of 0 to 1. The country is currently ranked 53rd in the FIFA World Rankings. Basketball is another sport which enjoys much popularity for both men and women. The country's national team had its most successful year in 2013 when it qualified for the AfroBasket, the continent's prime basketball event. A Burkinabé photographer at work in Ouagadougou. The nation's principal media outlet is its state-sponsored combined television and radio service, Radiodiffusion-Télévision Burkina (RTB). RTB broadcasts on two medium-wave (AM) and several FM frequencies. Besides RTB, there are privately owned sports, cultural, music, and religious FM radio stations. RTB maintains a worldwide short-wave news broadcast (Radio Nationale Burkina) in the French language from the capital at Ouagadougou using a 100 kW transmitter on 4.815 and 5.030 MHz. Attempts to develop an independent press and media in Burkina Faso have been intermittent. In 1998, investigative journalist Norbert Zongo, his brother Ernest, his driver, and another man were assassinated by unknown assailants, and the bodies burned. The crime was never solved. However, an independent Commission of Inquiry later concluded that Norbert Zongo was killed for political reasons because of his investigative work into the death of David Ouedraogo, a chauffeur who worked for François Compaoré, President Blaise Compaoré's brother. In January 1999, François Compaoré was charged with the murder of David Ouedraogo, who had died as a result of torture in January 1998. The charges were later dropped by a military tribunal after an appeal. In August 2000, five members of the President's personal security guard detail (Régiment de la Sécurité Présidentielle, or RSP) were charged with the murder of Ouedraogo. RSP members Marcel Kafando, Edmond Koama, and Ousseini Yaro, investigated as suspects in the Norbert Zongo assassination, were convicted in the Ouedraogo case and sentenced to lengthy prison terms. Since the death of Norbert Zongo, several protests regarding the Zongo investigation and treatment of journalists have been prevented or dispersed by government police and security forces. In April 2007, popular radio reggae host Karim Sama, whose programs feature reggae songs interspersed with critical commentary on alleged government injustice and corruption, received several death threats. Sama's personal car was later burned outside the private radio station Ouaga FM by unknown vandals. In response, the Committee to Protect Journalists (CPJ) wrote to President Compaoré to request his government investigate the sending of e-mailed death threats to journalists and radio commentators in Burkina Faso who were critical of the government. In December 2008, police in Ouagadougou questioned leaders of a protest march that called for a renewed investigation into the unsolved Zongo assassination. Among the marchers was Jean-Claude Meda, the president of the Association of Journalists of Burkina Faso. Every two years, Ouagadougou hosts the Panafrican Film and Television Festival of Ouagadougou (FESPACO), the largest African cinema festival on the continent (February, odd years). Held every two years since 1988, the International Art and Craft Fair, Ouagadougou (SIAO), is one of Africa's most important trade shows for art and handicrafts (late October-early November, even years). Also every two years, the Symposium de sculpture sur granit de Laongo takes place on a site located about 35 kilometres (22 miles) from Ouagadougou, in the province of Oubritenga. 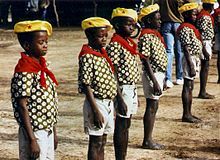 The National Culture Week of Burkina Faso, better known by its French name La Semaine Nationale de la culture (SNC), is one of the most important cultural activities of Burkina Faso. It is a biennial event which takes place every two years in Bobo Dioulasso, the second-largest city in the country. The Festival International des Masques et des Arts (FESTIMA), celebrating traditional masks, is held every two years in Dédougou. 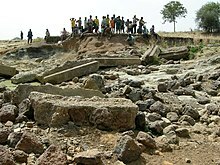 Damage caused by the Dourtenga floodings in 2007. Geographic and environmental causes can also play a significant role in contributing to Burkina Faso's issue of food insecurity. As the country is situated in the Sahel region, Burkina Faso experiences some of the most radical climatic variation in the world, ranging from severe flooding to extreme drought. The unpredictable climatic shock that Burkina Faso citizens often face results in strong difficulties in being able to rely on and accumulate wealth through agricultural means. Burkina Faso's climate also renders its crops vulnerable to insect attacks, including attacks from locusts and crickets, which destroy crops and further inhibit food production. Not only is most of the population of Burkina Faso dependent on agriculture as a source of income, but they also rely on the agricultural sector for food that will directly feed the household. Due to the vulnerability of agriculture, more and more families are having to look for other sources of non-farm income, and often have to travel outside of their regional zone to find work. ^ André, Géraldine (31 May 2007). "École, langues, cultures et développement". Cahiers d'Études Africaines (in French). 47 (186): 221–247. doi:10.4000/etudesafricaines.6960. ISSN 0008-0055. ^ "Burkina Faso population projection". 2017. Retrieved 8 January 2018. ^ a b c d "Burkina Faso". International Monetary Fund. ^ "Distribution of family income – Gini index". The World Factbook. CIA. Retrieved 1 September 2009. ^ CFA Franc BCEAO. Codes: XOF / 952 ISO 4217 currency names and code elements Archived 7 April 2014 at the Wayback Machine. ISO. ^ "burkina-faso noun – Definition, pictures, pronunciation and usage notes | Oxford Advanced Learner's Dictionary at OxfordLearnersDictionaries.com". www.oxfordlearnersdictionaries.com. Retrieved 20 November 2017. ^ "Violent Protests Topple Government in Burkina Faso", The New York Times. ^ Tens of thousands attend Burkina Faso protest, Protesters voice opposition to referendum that would allow Blaise Campaore to extend his presidential term, Al Jazeera (Reuters). Last updated: 1 June 2014 01:34. ^ a b "Burkina Faso coup: military says it now controls country after arresting leaders". The Daily Telegraph (Online edition). United Kingdom. 17 September 2015. Retrieved 17 September 2015. ^ "Burkina Faso coup: Michel Kafando reinstated as president". BBC News. 23 September 2015. Retrieved 23 September 2015. ^ a b c Mathieu Bonkoungou and Nadoun Coulibaly, "Kabore wins Burkina Faso presidential election", Reuters, 1 December 2015. ^ a b c "Burkina Faso swears in new president, capping transition", Agence France-Presse, 29 December 2015. ^ "Quebec woman and Italian friend missing in Burkina Faso". ^ "Burkina Faso Travel Advisory". Government of USA. 11 October 2016. Retrieved 6 January 2019. ^ "Africa - Burkina Faso". CIA. 21 December 2018. Retrieved 16 January 2019. ^ "Why the name: Burkina Faso?". 12 September 2013. ^ iAfrica – Ancient History UNTOLD. Forbidden Fruit Books LLC. p. 21. ^ UNESCO World Heritage Centre. "Site archéologique de Bura". unesco.org. ^ Miller, D. E.; Van Der Merwe, N. J. (2009). "Early Metal Working in Sub-Saharan Africa: A Review of Recent Research". The Journal of African History. 35 (1): 1–36. doi:10.1017/S0021853700025949. JSTOR 182719. ^ Stuiver, Minze; van der Merwe, Nicolaas J. (1968). "Radiocarbon Chronology of the Iron Age in Sub-Saharan Africa". Current Anthropology. 9 (1): 54–58. doi:10.1086/200878. JSTOR 2740446. ^ "Encyclopedia of the Nations." History. Advameg, Inc., n.d. Web. 8 October 2014. ^ a b "More (Language of the Moose people) Phrase Book". World Digital Library. Retrieved 16 February 2013. ^ Anyangwe, Carlson (2012). Revolutionary Overthrow of Constitutional Orders in Africa. African Books Collective. ISBN 9789956727780. ^ Manning, Patrick (1988). Francophone Sub-Saharan Africa: 1880-198. Cambridge: New York. ^ The name is an amalgam of More burkina ("honest", "upright", or "incorruptible men") and Jula faso ("homeland"; literally "father's house"). The "-be" suffix in the name for the people – Burkinabe – comes from the Fula plural suffix for people, -ɓe. ^ X, Mr (28 October 2015). "Resurrecting Thomas Sankara – My Blog". My Blog. Retrieved 25 April 2017. ^ "Reviving Thomas Sankara's spirit". www.aljazeera.com. Retrieved 25 April 2017. ^ Kasuka, Bridgette (2011). African Leaders. 3rd Paragraph: Bankole Kamara Taylor. p. 13. ISBN 978-1468114362. Retrieved 30 October 2014. ^ "Burkina Faso Profile." Burkina Faso Profile. BBC NEWS AFRICA, 21 March 2014. Web. 24 September 2014. ^ United Nation (2016). "List of Least Developed Countries" (PDF). un.org. Archived from the original (PDF) on 1 March 2011. ^ "BBC News – Burkina Faso parliament set ablaze". BBC News. 30 October 2014. Retrieved 30 October 2014. ^ "Burkina Faso protesters set parliament on fire, take over state TV and march on presidency". The Sydney Morning Herald. 30 October 2014. Retrieved 30 October 2014. ^ Gongo, Simon & Bax, Pauline. "Burkina Faso General Takes Power After President Resigns". Businessweek.com. Archived from the original on 2 January 2015. ^ Herve, Taoko and Cowelloct, Alan (31 October 2014) Burkina Faso’s President Resigns, and General Takes Reins. New York Times. ^ "BBC News – Army backs new Burkina Faso leader Isaac Zida". BBC News. November 2014. ^ "Burkina Faso talks agree on plan for return to civilian rule". Reuters. Retrieved 9 November 2014. ^ Raziye Akkoc (17 September 2015). "Burkina Faso coup: military says it now controls country after arresting leaders: live". agencies. The Daily Telegraph. ^ "Burkina Faso Leader Apologizes To Nation For Seizing Power In A Coup". Retrieved 23 September 2015. ^ "A Week After Coup, Burkina Faso's Interim President Back In Power". Retrieved 23 September 2015. ^ "Burkina Faso's Blaise Compaore sacks his government", BBC News, 15 April 2011. ^ "Burkina opposition calls anti-president demo". The Daily Star. 23 April 2011. Retrieved 24 April 2011. ^ Taoko, Hervé; Nossiter, Adam (27 April 2011). "Mayor's Home Burned as Burkina Faso Protests Continue". The New York Times. Archived from the original on 30 April 2011. Retrieved 30 April 2011. ^ Gongo, Simon (28 April 2011). "Burkina Faso Riot Police Join Wave of Protests After Government Dissolved". Bloomberg L.P. Retrieved 30 April 2011. ^ "Burkina Faso teachers' strike: Union agrees deal". BBC News. 25 May 2011. Archived from the original on 27 May 2011. Retrieved 28 May 2011. ^ "Burkina Faso government replaces its governors". Taiwan News. 9 June 2011. Retrieved 11 June 2011. ^ Tiendrebeongo, Aristide (March 2013). "Failure Likely". dandc.eu. ^ "Africa's human rights court and the limits of justice". www.aljazeera.com. Retrieved 27 October 2017. ^ "Burkina Faso 2015 Human Rights Report" (PDF). United States Department of State. 2015. Retrieved 3 June 2018. ^ "A Week After Coup, Burkina Faso's Interim President Back In Power". National Public Radio. 23 September 2015. Retrieved 23 September 2015. ^ "Burkina Faso Leader Apologizes To Nation For Seizing Power In A Coup". National Public Radio. 22 September 2015. Retrieved 23 September 2015. ^ "Burkina Faso profile". BBC News. 5 March 2018. ^ "Burkina Faso". 4 January 2018. ^ "Burkina Faso". Danube Travel. 26 November 2017. Retrieved 6 January 2019. ^ "Burkina Faso: Referendum on new constitution set for March 2019". Danube Travel. 28 August 2018. Retrieved 6 January 2019. ^ "Burkina Faso: Le référendum constitutionnel prévu le 24 mars 2019 - RFI". ^ "Burkina Faso capital under curfew after army mutiny". BBC News. 16 April 2011. Retrieved 17 April 2011. ^ a b "SIM Country Profile: Burkina Faso". Archived from the original on 9 March 2008. Retrieved 5 August 2006. ^ "OEC: Products exported by Bulgaria (2012)". The Observatory of Economic Complexity. Archived from the original on 4 September 2014. Retrieved 30 October 2014. ^ "Burkina Faso's Top 10 Exports". 17 January 2019. ^ "Burkina Faso Economic Outlook". ^ Profile – Burkina Faso. Inadev.org. Retrieved on 5 April 2014. ^ York, Jeoffrey (15 April 2012). "Iamgold's growing investment in Burkina Faso". The Globe and Mail. Toronto. ^ "Shiny future for Burkina Faso's gold-mining industry". ^ "Global Hunger Index | IFPRI". ifpri.org. Retrieved 20 November 2015. ^ a b c d "UN World Food Program". wfp.org. Retrieved 19 October 2015. ^ a b "The Cost of Hunger in Africa: Burkina Faso 2015" (PDF). African Union Commission. ^ "Statistics". UNICEF. Retrieved 19 October 2015. ^ "Education of Marginalized Populations in Burkina Faso". ^ a b c "ECHO Factsheet – Burkina Faso" (PDF). European Commission. 3 October 2013. ^ a b "The DHS Program – Burkina Faso: DHS, 2010 – Final Report (French)". dhsprogram.com. Retrieved 19 October 2015. ^ "Gains and losses as Burkina Faso fights child hunger". IRINnews. 11 March 2014. Retrieved 19 October 2015. ^ "Food Assistance Fact Sheet - Burkina Faso | Food Assistance | U.S. Agency for International Development". 19 October 2018. ^ a b c d e f g h i j "Burkina Faso | WFP | United Nations World Food Programme – Fighting Hunger Worldwide". wfp.org. Retrieved 19 October 2015. ^ a b "Burkina Faso Brief" (PDF). World Food Programme. ^ "Burkina Faso Transitional ICSP (January - December 2018) | World Food Programme". ^ "What We Do". worldbank.org. Retrieved 2 November 2015. ^ a b c d e f g "Projects : Agricultural Productivity and Food Security Project | The World Bank". worldbank.org. Retrieved 2 November 2015. ^ Pinstrup-Andersen, Per (21 January 2009). "Food security: definition and measurement" (PDF). Food Security. 1: 5–7. doi:10.1007/s12571-008-0002-y. Archived from the original (PDF) on 4 March 2016. ^ "Burkina Faso ICE Case Study". 1.american.edu. Archived from the original on 4 March 2016. Retrieved 2 November 2015. ^ "USAID Office of Food for Peace Burkina Faso Food Security Country Framework" (PDF). United States Agency International Development. ^ Burns, Cate (April 2004). "A review of the literature describing the link between poverty, food insecurity and obesity with specific reference to Australia" (PDF). VicHealth. Archived from the original (PDF) on 21 November 2015. ^ Hagberg, Sten (2001). "Poverty in Burkina Faso" (PDF). ^ Sasson, Albert (2012). "Food security for Africa: an urgent global challenge" (PDF). Agriculture and Food Security. 1: 2. doi:10.1186/2048-7010-1-2. ^ Headey, Derek & Shenggen Fan. "Reflections on the global food crisis: How did it happen? How has it hurt? And how can we prevent the next one? Vol. 165. Intl Food Policy Res Inst, 2010" (PDF). ^ a b West, Colin Thor (2014). "Famines are a Thing of the Past: Food Security Trends in Northern Burkina Faso". Human Organization. 73 (4): 340–350. doi:10.17730/humo.73.4.t6952215w6281m36. ^ "Burkina Faso: Programme Overview: Water, Sanitation & Hygiene (WASH)" (PDF). UNICEF. Retrieved 1 May 2018. ^ "Burkina Faso launches Sahel region's largest solar power plant". EURACTIV. 27 November 2017. Retrieved 6 March 2018. ^ "Burkina Faso". Retrieved 17 October 2014. ^ "Burkina Faso Road Network". Logistics Capacity Assessments (LCAs). Retrieved 4 August 2018. ^ a b c d e UNESCO Science Report: towards 2030 (PDF). UNESCO. 2015. pp. 472–497. ISBN 978-92-3-100129-1. ^ a b "Burkina Faso", U.S. Department of State, June 2008. ^ "West Africa slavery still widespread". BBC News. 27 October 2008. ^ Comité national du recensement (July 2008). "Recensement général de la population et de l'habitation de 2006" (PDF). Conseil national de la statistique. Archived from the original (PDF) on 21 April 2011. Retrieved 20 January 2011. ^ a b Comité national du recensement (July 2008). "Recensement général de la population et de l'habitation de 2006" (PDF). Conseil national de la statistique. Archived from the original (PDF) on 21 April 2011. Retrieved 20 January 2011. ^ a b International Religious Freedom Report 2010: Burkina Faso. United States Bureau of Democracy, Human Rights and Labor (17 November 2010). This article incorporates text from this source, which is in the public domain. ^ "Statistics in Burkina Faso". World Health Organization. ^ UN AIDS: HIV/AIDS – adult prevalence rate. Retrieved on 25 July 2014. ^ "Globalis – an interactive world map – Burkina Faso – Central government expenditures on health". Globalis.gvu.unu.edu. Archived from the original on 16 May 2011. Retrieved 1 October 2009. ^ a b "WHO Country Offices in the WHO African Region – WHO | Regional Office for Africa". Afro.who.int. Retrieved 20 June 2010. ^ "Dengue fever kills 20 in Burkina Faso". ^ "Education – Burkina Faso". Nationsencyclopedia.com. Retrieved 1 October 2009. ^ a b Salhi, Kamal (1999). Francophone Voices. Intellect Books. p. 37. ISBN 978-1-902454-03-0. Retrieved 26 April 2014. ^ Allan, Tuzyline Jita (1997). Women's Studies Quarterly: Teaching African Literatures in a Global Literary. Feminist Press. p. 86. ISBN 978-1-55861-169-6. Retrieved 26 April 2014. ^ Marchais, Julien (2006). Burkina Faso (in French). Petit Futé. pp. 91–92. ISBN 978-2-7469-1601-2. Retrieved 26 April 2014. ^ "Oxfam's Cool Planet – Food in Burkina Faso". Oxfam. Archived from the original on 17 May 2012. Retrieved 21 May 2008. ^ Spaas, Lieve (2000) "Burkina Faso," in The Francophone Film: A Struggle for Identity, pp. 232–246. Manchester: Manchester University Press, ISBN 0719058619. ^ Turégano, Teresa Hoefert (2005) African Cinema and Europe: Close-Up on Burkina Faso, Florence: European Press Academic, ISBN 888398031X. ^ "The FIFA/Coca-Cola World Ranking". FIFA.com. Retrieved 4 February 2017. ^ Keim, Marion (2014) [1st pub. 2014]. "COUNTRY PROFILE OF SPORT AND DEVELOPMENT – Sport and Popularity". Sport and Development Policy in Africa – Results of collaborative study of selected country cases. SUN PRESS. p. 206. ISBN 978-1-920689-20-9. ^ "Radiodiffusion-Télévision Burkina". Rtb.bf. Retrieved 1 October 2009. ^ Reardon, Thomas (1996). "Agroclimatic Shock, Income Inequality, and Poverty: Evidence from Burkina Faso" (PDF). World Development. 24 (5): 901–914. doi:10.1016/0305-750x(96)00009-5. ^ Ostergaard Nielsen, Jonas (February 2010). "Cultural barriers to climate change adaptation: A case study from Northern Burkina Faso". Global Environmental Change. 20: 142–152. doi:10.1016/j.gloenvcha.2009.10.002. ^ Barbier; et al. (2009). "Human Vulnerability to Climate Variability in the Sahel: Farmers' Adaptation Strategies in Northern Burkina Faso". Environmental Management. 43 (5): 790–803. Bibcode:2009EnMan..43..790B. doi:10.1007/s00267-008-9237-9. PMID 19037691. ^ Groten, S. M. E. (1993). "NDVI—crop monitoring and early yield assessment of Burkina Faso". International Journal of Remote Sensing. 14 (8): 1495–1515. Bibcode:1993IJRS...14.1495G. doi:10.1080/01431169308953983. ^ a b Reardon, Thomas; Matlon, Peter; Delgado, Christopher (September 1988). "Coping with household-level food insecurity in drought-affected areas of Burkina Faso" (PDF). World Development. 16 (9): 1065–1074. doi:10.1016/0305-750X(88)90109-X. Retrieved 2 November 2015. Rupley, Lawrence; Bangali, Lamissa & Diamitani, Boureima (2013). Historical Dictionary of Burkina Faso. The Scarecrow Press. ISBN 978-0-8108-6770-3. Engberg-Perderson, Lars, Endangering Development: Politics, Projects, and Environment in Burkina Faso (Praeger Publishers, 2003). Englebert, Pierre, Burkina Faso: Unsteady Statehood in West Africa (Perseus, 1999). Howorth, Chris, Rebuilding the Local Landscape: Environmental Management in Burkina Faso (Ashgate, 1999). McFarland, Daniel Miles and Rupley, Lawrence A, Historical Dictionary of Burkina Faso (Scarecrow Press, 1998). Manson, Katrina and Knight, James, Burkina Faso (Bradt Travel Guides, 2011). Roy, Christopher D and Wheelock, Thomas G B, Land of the Flying Masks: Art and Culture in Burkina Faso: The Thomas G.B. Wheelock Collection (Prestel Publishing, 2007). Sankara, Thomas, Thomas Sankara Speaks: The Burkina Faso Revolution 1983–1987 (Pathfinder Press, 2007). Sankara, Thomas, We are the Heirs of the World's Revolutions: Speeches from the Burkina Faso Revolution 1983–1987 (Pathfinder Press, 2007). Scholia has a topic profile for Burkina Faso. "Burkina Faso". The World Factbook. Central Intelligence Agency.